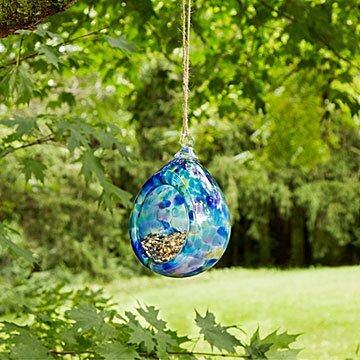 Made of hand-blown colored glass, this water droplet-shaped feeder attracts all the finest feathered ones. Hang this hand-blown glass "water droplet" from a tree, bush, pole, or eave, and it'll soon become the place where elite tweetsters meet to eat. Its mottled patches of blue, green, and purple glow like jewels when the sun shines through, creating an artful sanctuary for hungry birds. Heavy glass protects the birds' food from rain, snow, and wind, and the smooth, rounded shape keeps the in-crowd (those with feathers) in and wannabes (squirrels) out. Simply fill the glass with bird seed and start attracting fashionable feathered friends. Handmade in Seattle, Washington, where they've got a lot of time to think about water droplets. Clean with luke warm water and cloth. Store indoors during the winter. This feeder is beautiful and well made, but the birds rarely use it. I occasionally see a chickadee or nuthatch in it, but not often. I also have a platform and tube feeder, and it's only when those are very crowded that a bird will go into this feeder. It doesn't hold much seed and the seed spills out easily. It isn't squirrel or chipmunk proof, but now that I have a baffle on the pole it's on, that isn't an issue anymore. Yes, i would buy again. It is lovely. my friend loves bird feeders and i will probably buy one for myself. The bird feeder is a piece of art - almost too lovely to be outdoors. It will be placed in an area visible to people inside and to birds outside.